When studying the map of Europe and speculating where we should exercise the Boxster this year, Norway was not on our radar - too cold, too remote and too far north! But with the encouragement of our travel agent we had a closer look and decided to give it a try. We were not disappointed. 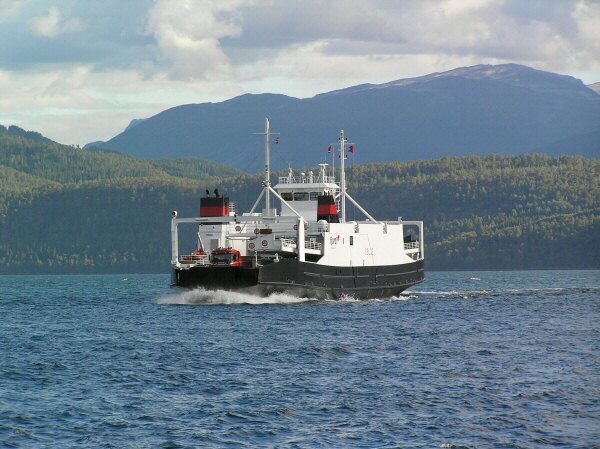 The most comfortable way to Norway with a car is by sea. 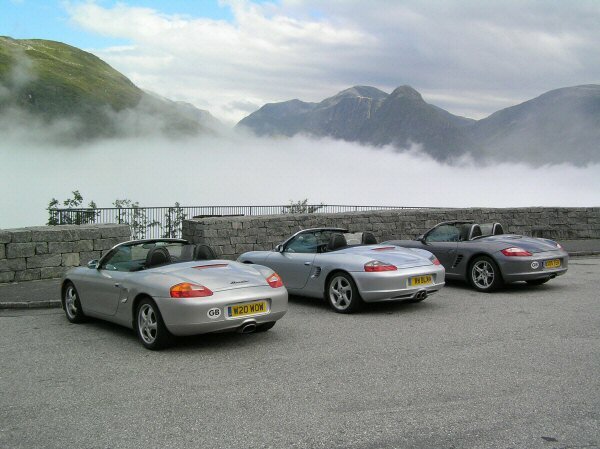 Our group of four Boxsters chose to travel from Newcastle to Bergen by Fjordline ferry, a misnomer really as their flagship is a 31,000 ton cruise liner catering for 1,500 passengers and their cars. After a brief stop in Stavanger we enjoyed a sunny meander through the coastal islands via Haugesund to Bergen. We were accompanied on board by around a hundred Rolls-Royce and Bentley cars and their owners, members of the Rolls-Royce Enthusiasts' Club bent on a similar tour to our own, but at a more sedate pace! 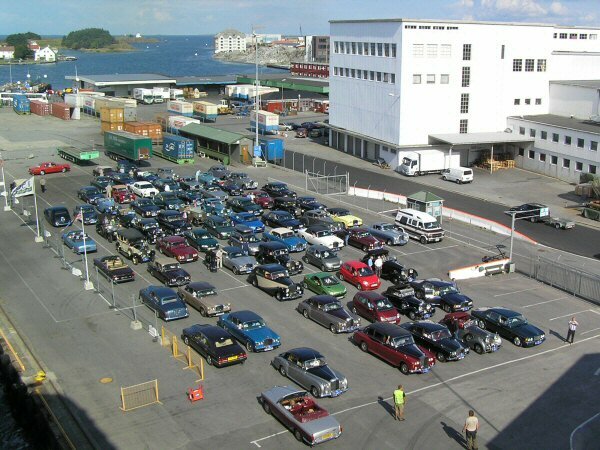 Such is their familiarity with the handling of large ferries the crew managed to unload all of them at Haugesund in under half an hour, providing the remaining passengers with a magnificent cavalcade spanning seven decades of England's finest motors. Our entry into Bergen harbour in bright sunshine gave us the first taste of Norway and its spectacular scenery. Once the capital city of Norway, Bergen is a charming mix of the old and the new. 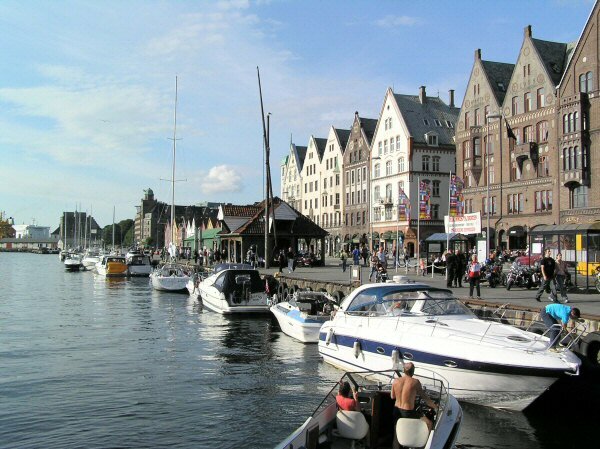 The Bryggen exemplifies this, an historic wharf of traditional wooden buildings facing a modern marina full of breathtakingly expensive private yachts, speedboats, catamarans and tall-masted sailing ships. The Norwegians seem to have a love affair with their boats, much as we do with our cars, and this was evident throughout our tour. 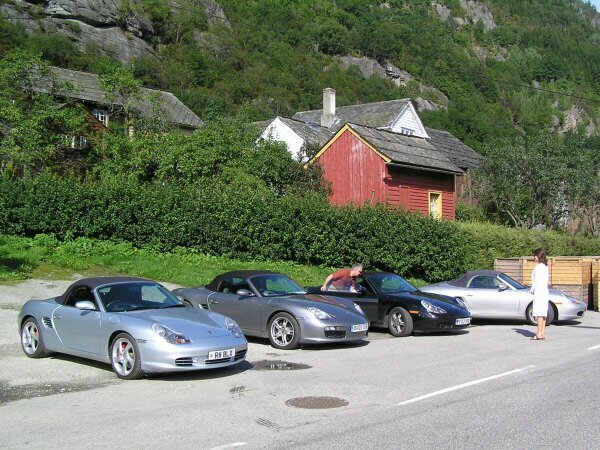 Cars were mainly functional and utilitarian, we encountered only two elderly Porsches and no Boxsters, but their money was clearly on the water. Our first evening introduced us to the financial realities of this wealthy country. Reputedly the richest nation in Europe it enjoys the benefits of north sea oil, abundant fish stocks, timber growing everywhere and lots of cheap hydroelectric power. With a largely static population of under five million and unburdened by the EU's uncontrolled migration policies, there is more than enough for everyone. The visitor, however, must face Norwegian prices from a less privileged standpoint. Restaurants and bars are best enjoyed without a calculator, and most things motoring make you wish you had bought them before you left Britain. However, the main roads are excellent, dotted with long tunnels and awe inspiring bridges, and the many ferries provide a welcome break with coffee and spotless loos without having to suspend your journey. We left Bergen on Sunday morning under ominous skies, and before we had quit the city the two of us with roofs that close in flight counted our blessings while those that did not tried desperately to drive fast enough until finding a stopping opportunity. Most speed limits are lower than those at home, only 55 mph even on the motorways, but we did our best to comply. Once in the back roads the traffic all but disappeared, offering us some exciting opportunities on the winding mountain sections. We found Norwegian drivers to be generally good; they were courteous and willing to concede and rarely overtook unless the obstacle was on four legs. Meeting a large truck and trailer at full tilt in a tunnel was not for the faint-hearted, but the requirement for headlights to be on at all times was quickly appreciated by us as a useful warning when approaching the many blind bends. 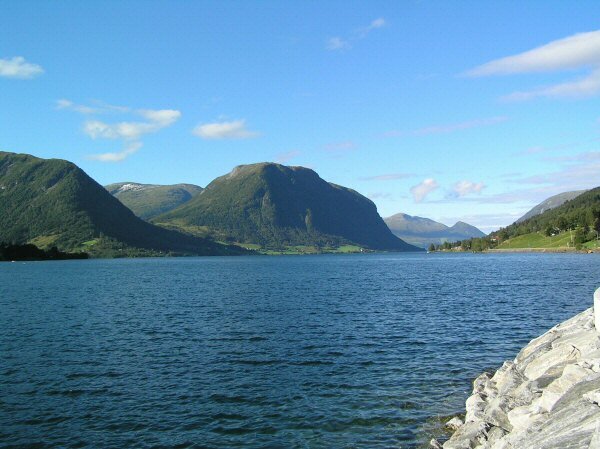 Our hotel in Skei, pronounced Shay, commanded a wonderful view from the end of Jolstravatnet lake and provided a perfect centre for touring the glacial area of central Norway. Despite its remote location we met a party of four who lived just four miles from our Warwickshire home, and Andy encountered his teacher from twenty years ago. It really is a shrinking world. One of the best trips we had was visiting the Briksdalsbreen glacier, part of the biggest glacial field in Europe. In bad weather it would have been a great disappointment, but happily we were blessed with a warm sunny day. We drove some fifteen miles to the end of a dead end road, parked, and then walked up a steep path to the icy foot of the glacier. 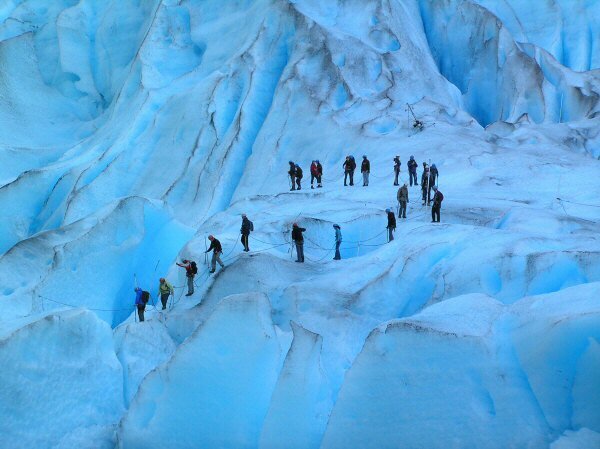 A few intrepid souls donned ropes and crampons and climbed onto the ice; we just marvelled at their bravery and enjoyed the sunshine from a safe distance! On the way home we encountered the massive cruise ship Oceana moored literally at the side of the road we were on, having somehow wound its way through the fjords over fifty miles inland. No doubt this was a real treat for the passengers, but I pondered how the inhabitants of the nearby village viewed the invasion of thousands of tourists - as a marketing opportunity probably. After three nights in Skei we headed south for Ullensvang. We called at the Norsk Bremuseum Glacier Centre to learn about the mysteries of glaciers, which included watching a dramatic 180 degree panorama video shot with multiple cameras from a helicopter. I prefer to see mine from the driving seat of a roadster! With the children back at school in Norway there were barely fifty visitors with us, so we were able to browse at our own pace and try the many working models without hassle. The museum cafeterias were spotless and good value for lunch or a snack, so they featured frequently on our itinerary. The early part of our journey south involved using a sixteen mile stretch of privately built toll road, which cost us about �14. This seemed a bit pricey until we drove along it. Two wide lanes through several long tunnels, one over seven kilometres long, gave us some spectacular photo opportunities and avoided a lengthy detour around some large mountains. As we emerged into the central plains we were surprised to find ourselves in a major fruit-growing area. Not massive fields and orchards but a plethora of tiny cultivations in every available crevice of arable land; a few apples here, some raspberries there, a couple of pear trees in a garden - and a fruit stall in every lay-by. At one point our party became split up, and I was amazed to find that our mobile phones still worked way up in the mountains. Although there were power cables everywhere, I saw few telephone lines. I suspect that, like much of Scandinavia, the low population density combined with the rugged nature of the terrain makes mobile telephony the most economic solution. Clearly, burying the cables is not an option. 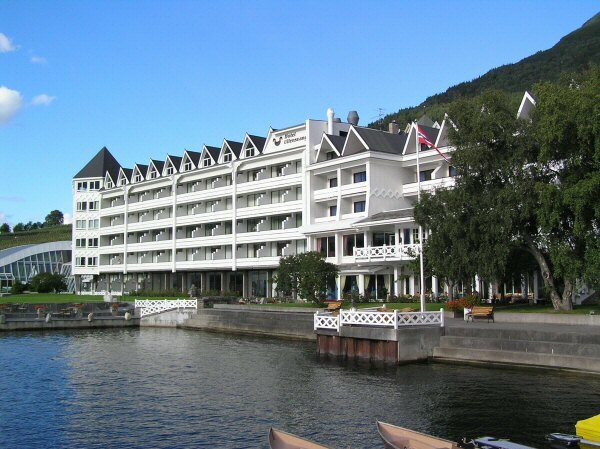 Our four star hotel in Ullensvang was located on the fjord shore and offered every conceivable facility. Chris had brought his tennis racket but failed to find a partner to share the indoor tennis court; Richard managed to clean his car using the coach cleaning bay, while the coach driver told him of the draconian penalties levied for speeding in Norway. 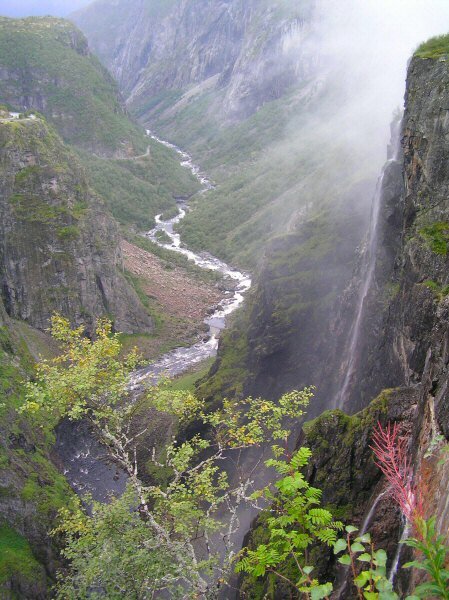 We all drove much more cautiously to the Hardangervidda Nature Centre and Voringfossen waterfall the following day. In addition to the main thoroughfares there were also many interesting offshoots, winding narrow single-track roads to unusual features and spectacular views. 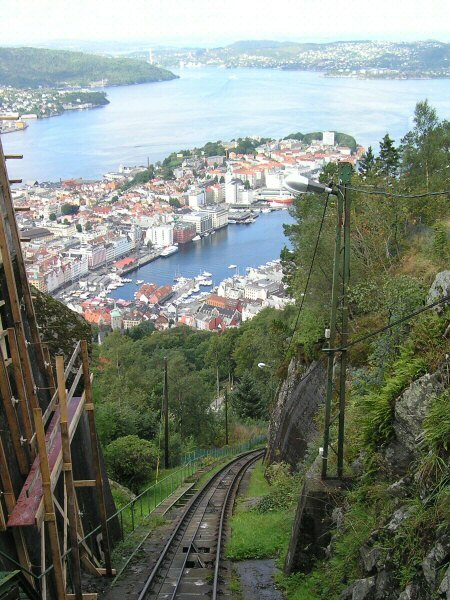 On our journey back to Bergen we took one of these up a mountain to an isolated dam and power generation plant. Half way up we met a 4x4 coming down, but seeing the four of us in convoy the driver obligingly reversed to one of the few passing points. 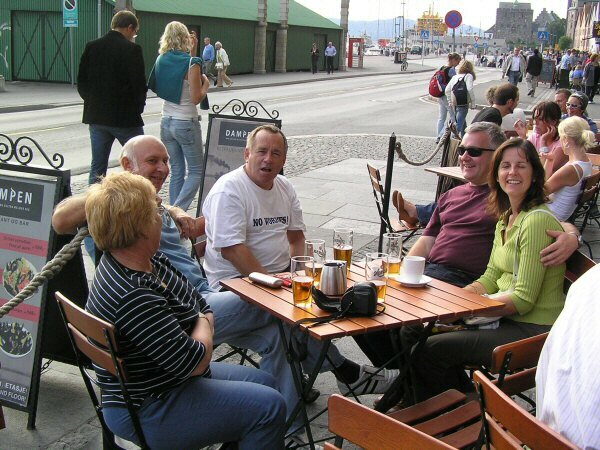 The Nordic body language restricts acknowledgement to other drivers to an almost imperceptible nod of the head; inwardly he was probably cursing tourists. As we approached Bergen during the Friday evening rush hour we met the only significant traffic on our trip. The short stretch of motorway we used had several speed cameras and a police patrol, something else we had not seen all week. It was gratifying that 'Helga', our name for the PCM SatNav voice, took us straight to our hotel without a hitch, bypassing much of the traffic leaving town for the weekend. This facility had provided us with a continuous map of our location throughout the trip, a great reassurance when venturing off piste in foreign parts. Bergen at the weekend is a lively city, the more so when the Rolling Stones World Tour is in town! The Bryggen was heaving and the bars full until about 7.30 pm, just before the Stones were due on stage, when it suddenly cleared and we were able to enjoy our dinner and a beer in peace. On our last day in Norway we took the funicular railway to the top of the mountain behind the old town and enjoyed an amazing panorama of the city, and spent all our remaining holiday money in the waterfront market on things we didn't need. As we queued to board the ferry home with a hundred Rollers and Bentleys, a customs man remarked that I was in the Rolls-Royce lane and not the Porsche one; it took me a moment to appreciate that it was a Norwegian joke! I looked around me at the other drivers and knew instantly which group had had the most fun. "Which lane would you choose?  ", I asked. "No contest" he replied, smiling at my car.